Well the party was a great success, the birthday cake applauded and everyone had a wonderful time. I have to pay special homage to my cousin’s wonderful chocolate cheesecake, which was my personal favourite of the dessert table! Now that I’m back home, back to work (boo!) 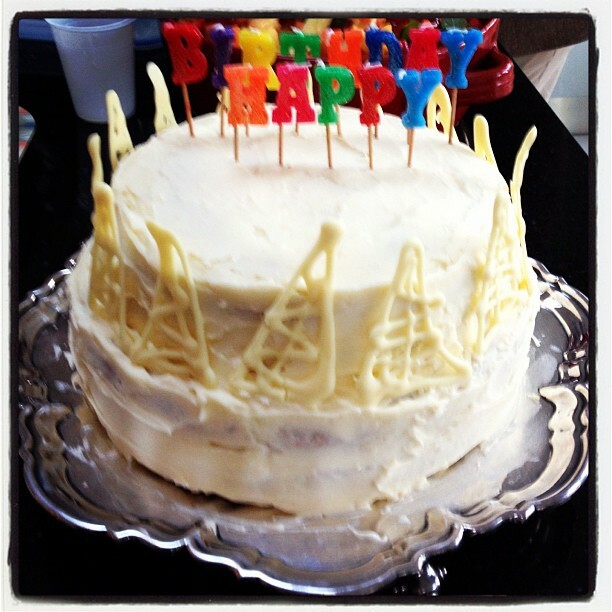 I thought I’d update the blog with two posts to complete this celebration cake bonanza. Once the cakes from part 1 are ready to go, you need a filling. Now previous posts about the joys of lemon curd hint at my favoured cake filling, but I wanted something that was a little more exotic for a special occasion. Passion fruit always make me think of my grandparents. My granddad is South African, my grandparents lived there for a bit in the 1950s and the flavours of the southern hemisphere were always present in their house – or at least in their fruitbowl! So what better way to fill my grandma’s birthday cake. Passion fruit curd adds an exotic zing of sweet and sharp and works well with the lemons in the cake and the sweetness of the icing. 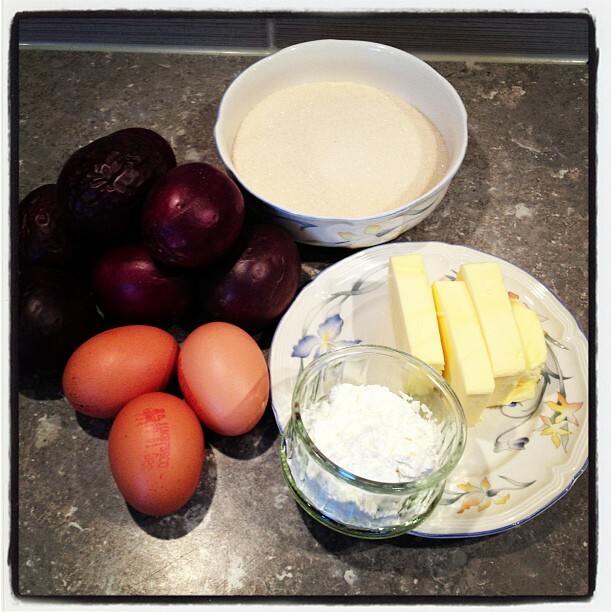 This recipe is adapted from the ever trusty and reliable bbc goodfood. INGREDIENTS: 9 ripe passion fruit, 3 large eggs, 140g butter, 200-250g caster sugar, 2 1/2 tablespoons cornflour, a few squirts of lemon juice to taste. TIP: The passion fruits must be ripe to get the right sweet/sour balance, so you might want to buy them about a week before you plan to use them. The wrinklier the better – a smooth skin is an under-done fruit! Cut the passion fruits in half and scrape all the seeds and pulp into a food processor. Pulse it a few times, which will separate the pulp from the pips. Then pour the mixture through a sieve into a saucepan set over a low heat. Use the back of a spoon to push as much of the pulp through the sieve as possible. PIPS OR NO PIPS? Now, at this point, most recipes I came across suggested reserving a few spoons of pips to put back in at the end. I’m not a fan of this personally, but you can do if you fancy. Pip look nice in a jar of homemade curd given as a present, but they are a tasteless and crunchy annoyance that is most likely going to get stuck in your teeth. As this curd was going into a cake (where you most certainly don’t want a crunch annoyance) I didn’t bother. 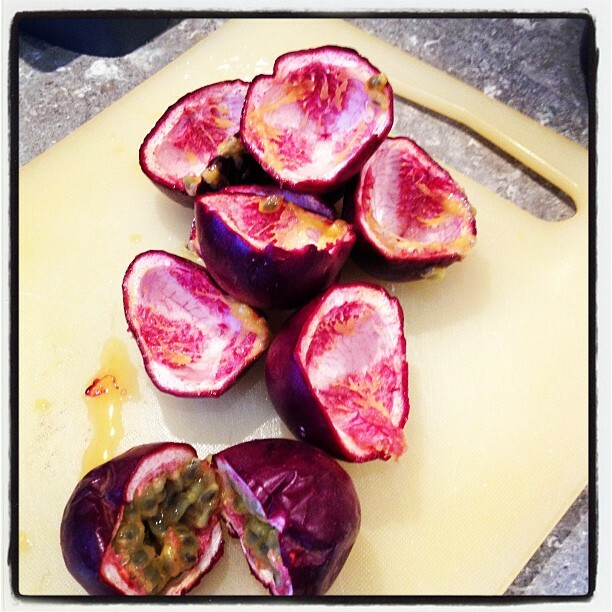 Passion fruit: A burst of colour inside and out! Add the butter, cornflour, eggs and sugar to the pan and continue to stir over a low heat until everything is fully dissolved/melted. TIP: The reason I’ve given a range on the quantity of sugar is because it’s all about taste. If your fruits are still a bit too sharp you’ll need more sugar, if they are very sweet, you’ll need less. 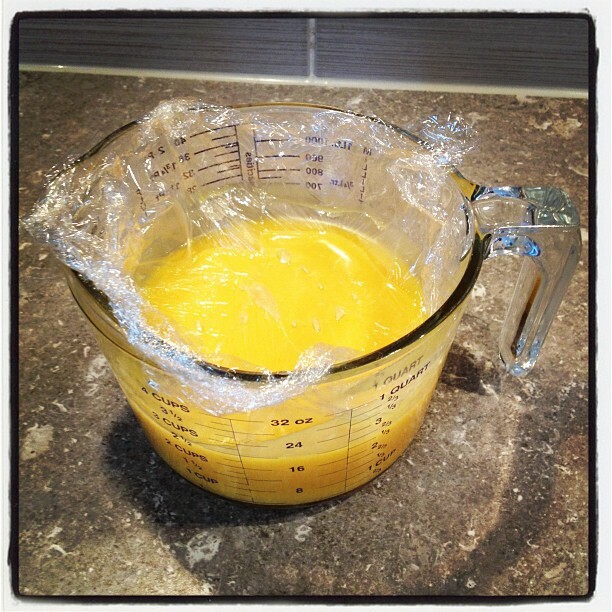 If you are unsure use about 225g and then use the lemon juice to adjust the taste. When everything is dissolved and you have a smooth mixture you need to keep on mixing. Don’t be tempted to turn up the heat to get it all thickening quicker. All you will make that way is scrambled egg. Keep mixing, remembering to scrape along the edges of the pan, and after up to 10 minutes (maybe more!) your mixture will thicken nicely. TIP: If you are making this curd to spread on toast, or stir into porridge, you might want a runnier consistency than I needed for filling a cake, so use 1/2 tablespoon less of cornflour. While it is thickening taste it. If you think it’s too sweet, use some lemon juice (a dribble at a time) to balance it out. If it’s too sharp use a little more sugar but make sure it dissolves. Don’t be tempted to squeeze in a whole lemon straight away – it’s a strong flavour which will take away the passion fruit taste. When its a good thick curdy consistency, take it off the heat. Unless you are going to use it immediately, when it has cooled decant into jars (remember to sterilise them!) and it will keep in the fridge for about 2 weeks. Top Tip: When you are leaving the curd to cool, place clingfilm over the surface to avoid a ‘skin’ forming. And there you have it! An exotic but homely passion fruit curd all ready to be spread in a cake, or eat on toast, in yoghurt… the possibilities are endless!